BTV job circular 2017. Bangladesh Television BTV has published a job circular 3 April 2017 on Bangladesh Pratidin and Daily Star Newspaper. 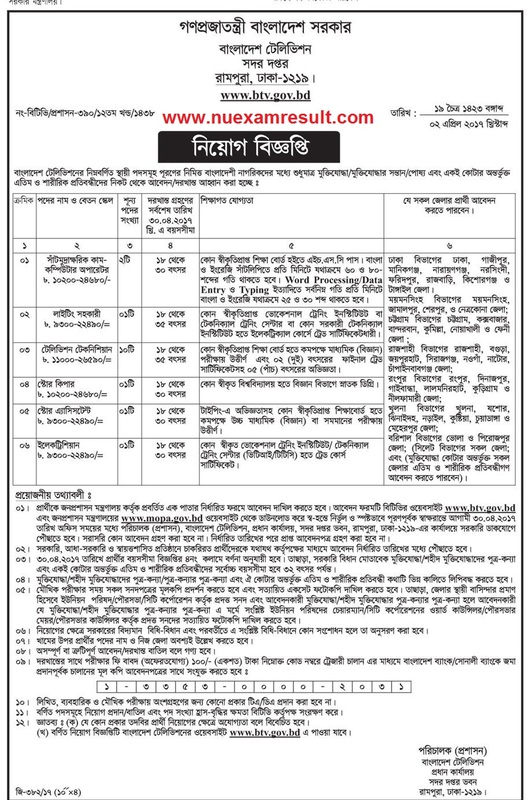 Bangladesh Television, the lone national TV channel of Bangladesh, is looking forward to recruiting a number of people to run their organizational works. For that the BTV authority has recently published a job circular asking for applications from interested personals. Before that it should be noted that BTV Job circular 2017 is applicable only for the candidates having freedom fighter’s background. So, general applicants will not be allowed to apply for these posts as mentioned in BTV Job circular 2017. The recruitment will be made in six categories and there are different sets of requirements and compensation for each of these. To learn more about these, please go through the full article here. Each candidate will have to submit the freedom fighter’s certificate and 100 taka as the application fee. There will be written test followed by a viva one. No TA/DA will be allowed during exam. To know more details please go to the website of BTV mentioned above. More details of BTV Job Circular 2017 and related jobs will be found in our website, please visit here as much as you can.